BEREA, Ohio: The post-season honors continue for Browns kicker Phil Dawson and left tackle Joe Thomas. Each was named to the Associated Press All-Pro Team on Saturday. Dawson and Thomas earned second-team mention. Dawson makes his first All-Pro squad after getting his first Pro-Bowl nod -- not a bad way to head into free agency. He converted 29-of-31 field goals. 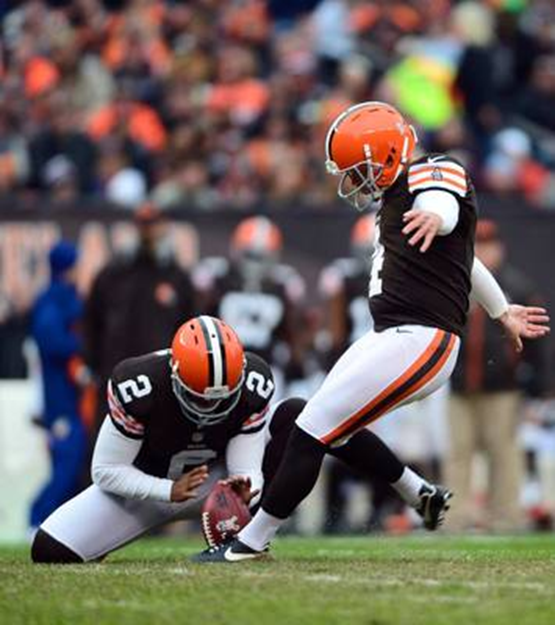 Most Browns fans will want to see new owner Jimmy Haslam invest money into their 37-year-old kicker. The Browns have the second-most projected salary-cap space in the NFL ($48.9 million), according to ESPN. Thomas made his fifth All-Pro side. He is a three-time, first-team member and narrowly missed top squad again by two votes from the 50-member media panel. He is a six-time Pro Bowler. Minnesota running back Adrian Peterson and Houston defensive end J.J. Watt were unanimous selections. NFL.com released the squads this morning with a voter breakdown by position.